The Perseus B, a remote piloted research aircraft, sits on the ramp, awaiting a test flight. In this historical photo from the U.S. space agency, the long, slender wing of the Perseus B remotely piloted research aircraft can be clearly seen in this photo, taken on the ramp of NASA's Dryden Flight Research Center in September 1999. 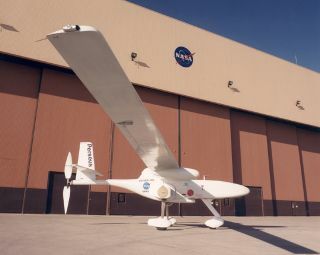 Perseus B is a remotely piloted aircraft developed as a design-performance testbed under NASA's Environmental Research Aircraft and Sensor Technology (ERAST) project. Perseus is one of several flight vehicles involved in the ERAST project. A piston engine, propeller- powered aircraft, Perseus was designed and built by Aurora Flight Sciences Corporation, Manassas, Virginia. Perseus is a high-wing monoplane with a conventional tail design. Its narrow, straight, high-aspect-ratio wing is mounted atop the fuselage. The aircraft is a pusher, designed with the propeller mounted in the rear. This design allows for interchangeable scientific-instrument payloads to be placed in the forward fuselage. The design also allows for unobstructed airflow to the sensors and other devices mounted in the payload compartment.